From high-tech hitting bays and simulator lounges to Toptracer-enhanced PGA TOUR broadcasts, global sports entertainment leader Topgolf is using technology to revolutionize the sports industry through products, platforms, and a truly inclusive approach to a sport that has been around for centuries. But that evolution certainly didn’t happen overnight. 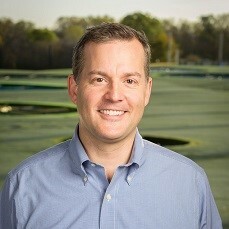 Join Topgolf VP of Technology Innovation Scott Lovejoy as he tells the Topgolf tech story – from the early days when pioneering target technology was thwarted by fish and tree branches to the creative adaptation of IoT technology that helped transform Topgolf into the entertainment empire it is today and redefine an entire sport.